“Quiet” and “lovely” are not usually words one reaches for when describing a post-apocalyptic novel. Not with the reverted-back-to-savagery cannibals; the road-raging-mohawk-sporting highway warriors; the gleeful told-you-so rat-a-tat of survivalist gunfire, or the annoying mumblespeak “braiiinnnnss” from the shambling zombies. But quiet and lovely are exactly the words I’d use to describe Station Eleven, the post-apocalyptic novel from Emily St. John Mandel that is happily missing all the above and shows the modern world ending with neither a bang nor a whimper, but with a gentle murmur. Mandel’s chosen method of ending the world is the Georgia Flu, an incredibly virulent bug that wipes out 95+ percent of its victims within a span of 48 hours. In true form for the eventual tone and shape of the novel, though, Mandel opens not with a mass of deaths but instead with one very singular, very hushed one: famed movie star Arthur Leander, who dies of a heart attack on stage while performing King Lear in Toronto. A young EMT in the audience, Jeevan, first tries to resuscitate Arthur, and then, when the ambulance crew takes over, has a few moments of awkwardly trying to comfort the young child actress, Kirsten, who saw the whole thing. It is while Jeevan is walking home, his girlfriend having abandoned him at the theater, that one of his friends from the city hospital calls to warn him of the flu currently rampaging through the local hospitals and it is this that saves Jeevan’s life. The story moves back and forth in time. Present time is twenty years after the flu collapsed society — electricity is gone, borders (federal, state, local) are non-existent, travel is by foot or animal, and a group called The Traveling Symphony moves from town to town in the Michigan area, performing Shakespeare and playing concerts. The flashbacks, meanwhile, take us back in time to Arthur’s first starting out as an actor, and though Arthur is dead before the Collapse, it is the relationships he formed in his life that ripple throughout the present-day storyline: his first wife Miranda, his second wife Elizabeth and their son Tyler, his best friend Clark. Even his most flimsy or briefest of relationships — with Kirsten during the King Lear run or with Jeevan, whom he never really “met” — end up weaving in and out of the story, as connections between characters form and fray and form again. There is a sense as well that not only is that world lost, but even the memory of it is fading as well. Kirsten, who was eight at the time, remembers almost nothing of the pre-collapse world, survivor settlements have questions about whether it makes sense to teach those born after the collapse about that no-longer-existent world, even as rumors run from town to town of a Museum of Civilization, a collection of pre-collapse artifacts. It’s a testament to Mandel’s writing that I wanted to see that Museum; she has me missing a world I actually live in. Can one even be nostalgic for the present? This lost world theme is mirrored by the eponymous Station Eleven, a beautifully drawn (and lovingly detailed in the novel) comic book set on a space station inhabited by survivors of an alien attack on Earth, who also are split amongst those looking forward and those looking back. All the above sound as if Station Eleven is never anything but dolefully woe-ridden, but this isn’t the case. If we see relationships crumble, we also see them reform or new ones emerge. If there is an entire litany of material objects lost to the new world, Mandel shows as well how some object, some things, remain, moving from person to person or perhaps staying with one for a long, long time. Our attachments to things, our deeply personal, emotional attachment to mere objects, is one of the oddest attributes of humans I’d say, and Mandel does a wonderful job of depicting just that. These objects, like the relationships, weave in and out of the storyline; just as we see how these people ended up together, or apart, we see how this object ended up in this person’s possession, how that one ended up in that person’s. The entire novel is meticulously crafted, the structure a wonderful tracery of such threads, and it was sheer pleasure each time I realized just how the threads connected. There is a plot; it isn’t all relationships and longing. Besides the story of Arthur’s life and the people in it, in the present time there is a more suspenseful, more “typical” post-apocalyptic storyline involving a man known only as The Prophet. The Traveling Symphony, though no fault of their own, end up on the wrong side of the Prophet and his followers. There is danger, gunfire, deaths, disappearances, a journey (quest almost) to the rumored Museum of Civilization. But even working this more usual vein of the genre, Mandel mines it for more unusual material; the typical elements are extremely brief; the atypical ones poignant, moving, and like all else, they fit unerringly into the airtight structure. Really, there isn’t much of a misstep anywhere here. And I haven’t even mentioned the way art is raised throughout as a major theme — one of the Traveling Symphony’s tag lines being “Survival is insufficient” — or the use of Star Trek (from which that line was taken). Mandel has taken a near-perfectly crafted text in terms of structure and style and imbued it with a haunting depth of feeling and heart. That makes for a winning combination every time. And will probably put this book on my top ten list (though after the past two weeks, I might have to make that a top fifteen). Highly recommended. Arthur Leander is one of the finest actors of his generation — certainly one of the most famous — and his life’s relationships form the hub of Emily St. John Mandel’s post-apocalyptic novel Station Eleven. The story begins with Arthur’s death: he’s on stage in Toronto, playing Shakespeare’s Lear, when he collapses from a heart attack. Station Eleven shifts through multiple perspectives and it’s, to say the least, non-linear, so it’s probably easiest to map the novel’s characters by how they relate to Arthur at the time of his death. Kirsten is a child actor in the play. Jeevan is a paramedic in training who rushes to the stage to save Arthur (there’s nothing he can do). Miranda was Arthur’s first wife, and though she remains a target for the paparazzi when she returns to Toronto to visit her ex-husband, she has otherwise moved on with her life. Miranda met Arthur long ago when she was still creating Station Eleven, a graphic novel. Clark, meanwhile, is Arthur’s long time friend, left in charge of contacting Arthur’s family members and ex-wives after the actor’s death. He was a man who repented almost everything, regrets crowding in around him like moths to a light. This was actually the main difference between twenty-one and fifty-one, he decided, the sheer volume of regret. A successful actor, Arthur has everything, but what he wants is a second chance in life. He is determined to shed the past in order to start over. Emily St. John Mandel uses her post-apocalyptic setting to reflect and explore Arthur’s conflicts (without him, for the most part). The apocalyptic agent, a pandemic flu, preys upon all networks and communities, and when it is done, the survivors start anew. What’s happening to Miranda is literally life changing, and yet it flies by in the midst of a paragraph — and Station Eleven is full of (pre-collapse) paragraphs like these. For better or worse, these paragraph suffice. If you are the light, if your enemies are darkness, then there’s nothing you cannot justify. There’s nothing you can’t survive, because there’s nothing that you will not do. She’s right: the prophet is a relentless and merciless fanatic. The Traveling Symphony leaves St. Deborah by the Water, but they find a stowaway in their wagons — one of the Prophet’s wives. They flee and the Prophet chases, picking them off one at a time as they journey through the forests. There’s an urgency in Kirsten’s post-apocalyptic life that is missing from Arthur’s, but it’s worth noting that since starting over, Kirsten has collected her share of regrets. She has two knives tattooed on her body to represent people she’s had to kill in order to survive. And while a life devoted to art sounds nice and while it reminds us that “survival is not enough,” the Traveling Symphony is mostly petty, vain, and, ironically, bored by the mundane routines and details that make up their lives. Clark, meanwhile, settles in an abandoned airport. Though he feels more himself in this world than he did in the world before the flu, he nevertheless misses airplanes, phones, and the Internet — “these taken-for-granted miracles that had persisted all around him.” I couldn’t help recalling Louis CK’s everything’s amazing and no one is happy bit. Perhaps Arthur would do well to realize that starting over isn’t so easy. Should readers bother with Station Eleven? There’s an argument to be made that they should not. There are many moments in St. John Mandel’s novel that recall other post-apocalyptic texts. The novel’s title is taken from a series of comic books, which reminded me of Alan Moore’s The Watchmen and “The Tales of the Black Freighter.” The pandemic flu and the non-linear narrative that jumps from before the end to after recalls Atwood’s Oryx and Crake. There is a section in which an amateur journalist attempts to document the past through interviews with survivors, which recalls Max Brooks’s use of Studs Terkel’s histories as an inspiration for World War Z. Haven’t we read so many of these stories that Station Eleven will ultimately be remembered as just another entry in a fleetingly popular subgenre? But there’s also an argument to be made for Station Eleven. I was particularly struck while reading the novel how smoothly it spoke from 2014. St. John Mandel explores pandemic flu and violent religious extremism, two of the biggest news stories of the year. And while many will find St. John Mandel’s use of Shakespeare admirable, I was more surprised by her near constant allusions to contemporary popular culture. She references Justin Cronin’s The Passage and Star Trek (Voyager, not Into Darkness) directly. A character with a crossbow appears, which I immediately assumed was a reference to Daryl from the TV adaptation of The Walking Dead. Ultimately, few readers of the post-apocalypse will regret putting a week aside for Station Eleven. Post-apocalyptic texts often invite us to reconsider our current lives — a chance to fantasize about a new start or a second chance. With Arthur’s life of regrets, St. John Mandel is not reinventing the genre so much as she is writing within it skillfully and insightfully. While I wouldn’t rate Station Eleven as strong as many of the post-apocalyptic texts it recalls, I did enjoy reading it. It might be “just another post-apocalyptic novel,” but, then again, it might be 2014’s best post-apocalyptic novel. When most people think of post-apocalyptic stories, they imagine big clunky action plots, zombies and barren wastelands. Maybe a ripped action hero in the calibre of Will Smith. That’s why Emily St. John Mandel’s Station Eleven came as such a surprise. It is complex, poetic, beautifully imagined and intricately plotted. The novel opens with a death, but not one caused by the flu pandemic that is about to wipe out 99% of humanity. Arthur Leander is performing King Lear on stage when he has a heart attack. Arthur’s final performance is the event that ties together the lives of the cast of characters in the wake of the pandemic. First there is Jeevan, one of the more memorable side characters, a paramedic in training who is in the audience at the theatre. On stage is Kirsten Raymonde, an eight year old actress with a minor part in the play. As the performance is cut short, airplanes are already being grounded, hospitals are overflowing. The flu is beginning to spread. The next time we meet Kirsten, twenty years have passed and the world is unrecognisable. There is no electricity, gas, running water or medicine. Small groups of people — the remnants of humanity — have made settlements in gas stations and airports, with larger cities having been largely abandoned after the crime and violence in the immediate wake of the pandemic. One such group is the travelling symphony, which Kirsten is part of. It consists of about twenty musicians and actors who travel the coast performing Shakespeare. Their motto is a line from Star Trek: “Survival is insufficient,” a mentality that forms the kernel of the novel. The symphony arrives at the town of St Deborah by the Water to reunite with two members of their troupe that had left to have a child. What they find instead is the enigmatic Prophet. He claims that the epidemic was a gift, that he is the light sent to eradicate the darkness (and this is the only predictable aspect of the novel: lumping the ‘bad guy’ with the generic pseudo-religious fanaticism). When she finds two grave markers with her friends’ names on them, Kirsten knows something is wrong. Coming to St Deborah by the Water has put the troupe in danger and getting to their destination of the Airport where a large settlement now lives will be fraught with tribulations. The scope of Station Eleven is considerable, as Mandel weaves the characters’ lives and fates around the character of Arthur Leander. Flashbacks provide insight into his life as a famous actor, his many marriages, focussing on his first wife, Miranda, who created the Dr Eleven comics about a man who leaves behind the sorrows of earth to try and found a new civilisation. The comic pops up again and again, and often mirrors real-life events in the novel. Mandel threads repeated imagery and symbols through the story, and the astute reader will pick up on subtle links and clues between characters. Some critics have said that Mandel doesn’t create a realistic portrayal of humanity in crisis, that the characters should be more strained under exhaustion, starvation and fear. But the whole point of the novel is surely to examine what aspects of humanity are maintained under crisis; thus the notion of the Travelling Symphony is born. It’s the beauty of the book: who needs another post-apocalyptic story about humans tearing each other’s throats out? Station Eleven is about civilisation enduring, and characters behave as if they are trying to preserve those pivotal aspects of humanity. Station Eleven, by Emily St. John Mandel, is a book you need to read. In a market cluttered with variations of the apocalypse and post-apocalyptic life, this one is the deepest and the quietest; the most poetic and the most literary in the best sense of that word. Yes, it’s a quiet, poetic literary “After the End of Everything” novel. Station Eleven stretches out, backward and forwards in the story’s timeline, like an intricate spider web, and the enter of this delicate but strong narrative is Arthur Leander, actor and former superstar. Arthur had a huge movie career when he was younger. Now fifty-one, he feels his fame waning. At a performance of an unusually-staged King Lear, Arthur suffers a heart attack and dies. This happens in the first five pages of the book. By dying, Arthur escapes that terror and panic that is only days away. An influenza strain, called the Georgian Flu because it was discovered in that country, is finding its way across the world, helped by pan-continental air travel. Jeevan, the young paramedic in training, and Kirsten, a child actress Arthur had befriended, are both present when Arthur dies, and both escape the flu. Twenty years later, Kirsten, travels with the Traveling Symphony, caravanning (most of the actors and musicians on foot) from settlement to settlement in a recovering, post-high-tech United States. The Symphony plays classical music and puts on Shakespearean plays. Kirsten, now in her early thirties, feels at home with the Symphony. Things have settled down from the days of the flu, although the world is not safe, and people must do things they hate in order to survive. The two daggers tattooed on Kirsten’s arm attest to that. In a small town where Kirsten hopes to reconnect with two performers who stayed to raise their child, the Symphony comes to the attention of a leader who calls himself the Prophet and his henchmen. At first glance, this part of the story seems traditionally post-apocalyptic, and it is. What is different is the origin of the Prophet. Station Eleven moves back and forth in time, sharing bits from Arthur’s life, and following various people who are connected to him. We follow two of his ex-wives, his best friend, and Arthur himself. Absent from the story, but driving part of it, is his childhood friend Victoria, who lives on the island in Puget Sound where Arthur grew up. Every primary character in the book, from before the flu or after, has some connection with Arthur. Mandel is not particularly interested in the technology of survival and recovery. She is interested in the human spirit, the connections we make and how those connections nurture (or poison) us. The motto of the Traveling Symphony is “Because survival is insufficient.” This is taken from a Star Trek episode. Kirsten has adopted this as her personal motto and it is tattooed onto her arm. People walk hundreds of miles to perform Shakespeare, because survival alone is not enough. In an abandoned airport, Clark, Arthur’s best friend, creates a Museum of the Twenty-First Century to remind people of what life was like. Both Kirsten and the Prophet are inspired and guided by a strange, limited edition comic book (there were only two volumes, and only two copies printed) called Station Eleven, a study in isolation and humanity. Station Eleven was drawn and written by Miranda, Arthur’s first wife. The book is beautifully written and often drily funny. Probably the people who will get the most enjoyment out of Clark’s pre-flu job, and the later discussion in the Museum, are people who have had a 360-degree evaluation or used some kind of management consultant. Jeevan’s stint as a paparazzo is funny but sad. I could probably write an entire column on his off-handed comment to Miranda about his job being like combat, knowing that later he will stay with his wheelchair-bound brother, an embedded reporter who was shot in Afghanistan. The heart of the book, though, is Arthur. Arthur’s art may be a guiding light that travels, as he does not, into the post-flu future, but his acts of kindness toward an unhappy child actress are what survive. Kirsten is shaped in more than one way by her memories of Arthur. Most post-apocalypse books don’t deal with the human spirit. While characters like the Prophet are common, the battle is usually for control, and the focus is military. In Station Eleven, what is most interesting about the Prophet is where he came from. A solidly literary writer, Mandel still takes the time to think through, for the most part, what society immediately after a catastrophic die-off might be like. There is an actual story in the book’s present timeline, not just endless meditations on aloneness. At the same time, Mandel knows exactly what it is she wants to explore here, and does it thoroughly. Instead of trying to ring all the SF “bells,” she sticks to the story she wants to tell. I can’t recommend Station Eleven enough. I stood looking over my damaged home and tried to forget the sweetness of life on Earth. Station Eleven is an elegy lamenting all that humanity has lost when over 99% of the world’s population is killed in a flu pandemic, with quiet notes of hope added by the love and connections that people still create and the arts that they refuse to let die. Loss and hope both permeate this bittersweet tale of a post-apocalypic world. The story follows several different characters both before and after the disastrous epidemic: Miranda, the artist who creates the titular Station Eleven series of graphic art books, a symbol of the twilight world the survivors find themselves inhabiting. Kirsten, an 8-year old actress who survives the epidemic and in the aftermath ends up with a traveling company that combines music and Shakespeare performances for survivors. Jeevan, the former paparazzo and paramedic who survives by holing up with his disabled brother in an apartment with 17 shopping carts’ worth of food and supplies. These and other characters’ stories are tied together by Arthur Leander, a famous actor who dies at a relatively early age of a heart attack, on the night the plague begins to take root in North America. I’m not certain that I entirely agree with the choice to put so much focus on Arthur, whose adult life is filled with wealth, fame and self-indulgence. The most telling point about Arthur for me was when he tells another character that he “has to” leave his second wife for another woman, because he’s fallen in love with someone else. That’s the story of Arthur’s self-absorbed life right there. Toward the end of his life it seems like he’s starting to realize what he’s given up and to take some steps to try to rectify that. But, of course, it’s too late, for him and almost everyone else. But Arthur does pass on two copies of the Station Eleven comic books given to him by his first wife, to two children who will survive the epidemic. The Station Eleven comics become talismans for these children, in very different ways, one more thread that links characters to each other, and the past to the present. This was enthralling — I had a hard time putting it down. Mournful but also hopeful, there’s tragedy and love and losing your way and connecting to others, all swirled together. I had a few quibbles, but this one will stick with me longer than most books. It’s hard to review a book that has already been praised to the rafters. 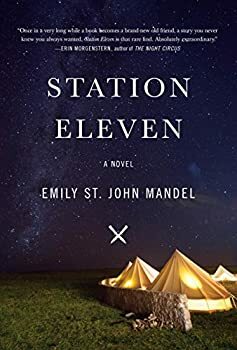 There are hundreds of reviews that speak eloquently about Emily St. John Mandel’s Station Eleven, with its focus on the arts, relationships, and all the little moments that make up our lives. Based on all the glowing reviews, I needed to read the book myself, even if it’s not my usual cup of tea. And yes, they were right. It’s very good indeed. Station Eleven is that rare book that both mainstream and genre readers can appreciate and enjoy. It’s the antithesis of Cormac McCarthy’s The Road, which I hated, focusing not on the brutal ugliness of survival after society collapses, but rather shows how people in the aftermath look back upon our present wistfully and mourn the loss of what we now take for granted. In that, the book succeeds magnificently. With copious flashbacks that are smoothly incorporated to the main narrative of The Traveling Symphony, we are gradually shown how our modern society is an intricate web of human relationships, some positive and others destructive, as love is born, dies, and reborn with new partners. Friendships come and go, evolve, transform. Parents raise children, and children reach adulthood, realizing the influences that their parents have had. In the vastly depopulated world after the Georgia Flu (not the Peach State, the country in Europe), which wipes out 95% of the global population, we see the remnants of society in scattered pockets. Not just surviving, but in the case of The Travelling Symphony, an itinerant group of actors and musicians go from town and outpost, performing for the locals and preserving the arts. This could come off as very contrived, but Mandel does a good of not making it preachy. These people do this as a matter of course in their lives — it gives them meaning and impetus to go on living in a melancholy and drastically diminished world. We are introduced to The Museum of Civilization, an impromptu collection of artifacts from our world like iPhones, credit cards, various electronic devices, all the detritus of a material society that is no longer of any practical use in a brave new world that doesn’t have a name for itself or even for the calamity that destroyed civilization. It’s pretty surprising how much Mandel sprinkles very time-specific references, which are topical to today’s reader but will become dated within 5-10 years. The characters that inhabit Mandel’s world are skillfully sketched in a series of flashbacks. Much of what happens in the lives of famous actor Arthur Leander, his first wife Miranda, his best friend Clark, the paparazzi and medic Jeevan, his second wife, the little child actress Kirsten who grows up to be a tough survivor, and the sinister Prophet who forms a cult of zealots who believe they are the chosen ones spared by God for a purpose (this is a typical post-apocalyptic theme, but isn’t over-emphasized). Then there is the mysterious comic book, Doctor Eleven, that is written by Miranda, but is carefully preserved by Kirsten and also read by the Prophet. It’s a story within a story, a parallel story of survival in space after fleeing an alien invasion. Miranda poured herself into this imaginary world to escape the life of fame she never wanted when she married Arthur. Is this any different from us reading stories like Station Eleven to escape our everyday lives? The metaphor is nicely understated, as the whole book is. There is no clubbing the reader over the head, just gentle reminders that the lives depicted in this tale are not all that different from the lives we lead in the “real” world. I’ve read dozens of post-apocalyptic novels, so those elements were nothing special. Actually I like the fact that Mandel didn’t focus on them much — she’s not interested in that. It’s the melancholy notes of loss she chooses to emphasize, and to great effect. I was reminded of a classic post-apocalyptic novel called Earth Abides (1949) by George R. Stewart, along with my favorite coming-of-age SF novel set in a pastoral post-apocalyptic US that also features musicians, actors, and an oppressive Church, Davy (1964) by Edgar Pangborn. These books also focus on the loss of modern civilization and the quiet rural life of the survivors. However, unlike Station Eleven, they actually suggest that the loss of modern industrial civilization is an opportunity to return to a simpler, more robust way of living, whereas Mandel clearly wants to point out the good in our modern lifestyles. If I had any criticism of the book, it would be that she only focuses on the lives of the well-off members of American society who are well-educated, urbane, intelligent, middle-class or higher. But that is who her story is about, so why complain about something the book is not? It’s a beautifully-written and understated story that makes you stop and think, what would it be like to lose the life you lead and the people you love? Publication Date: September 9, 2014. An audacious, darkly glittering novel set in the eerie days of civilization’s collapse, Station Eleven tells the spellbinding story of a Hollywood star, his would-be savior, and a nomadic group of actors roaming the scattered outposts of the Great Lakes region, risking everything for art and humanity. One snowy night Arthur Leander, a famous actor, has a heart attack onstage during a production of King Lear. Jeevan Chaudhary, a paparazzo-turned-EMT, is in the audience and leaps to his aid. A child actress named Kirsten Raymonde watches in horror as Jeevan performs CPR, pumping Arthur’s chest as the curtain drops, but Arthur is dead. That same night, as Jeevan walks home from the theater, a terrible flu begins to spread. Hospitals are flooded and Jeevan and his brother barricade themselves inside an apartment, watching out the window as cars clog the highways, gunshots ring out, and life disintegrates around them. Fifteen years later, Kirsten is an actress with the Traveling Symphony. Together, this small troupe moves between the settlements of an altered world, performing Shakespeare and music for scattered communities of survivors. Written on their caravan, and tattooed on Kirsten’s arm is a line from Star Trek: “Because survival is insufficient.” But when they arrive in St. Deborah by the Water, they encounter a violent prophet who digs graves for anyone who dares to leave. Spanning decades, moving back and forth in time, and vividly depicting life before and after the pandemic, this suspenseful, elegiac novel is rife with beauty. As Arthur falls in and out of love, as Jeevan watches the newscasters say their final good-byes, and as Kirsten finds herself caught in the crosshairs of the prophet, we see the strange twists of fate that connect them all. A novel of art, memory, and ambition, Station Eleven tells a story about the relationships that sustain us, the ephemeral nature of fame, and the beauty of the world as we know it. RYAN SKARDAL, on our staff from September 2010 to November 2018, is an English teacher who reads widely but always makes time for SFF. RACHAEL "RAY" MCKENZIE, with us since December 2014, was weaned onto fantasy from a young age. She grew up watching Studio Ghibli movies and devoured C.S. Lewis’ CHRONICLES OF NARNIA not long after that (it was a great edition as well -- a humongous picture-filled volume). She then moved on to the likes of Pullman’s HIS DARK MATERIALS trilogy and adored The Hobbit (this one she had on cassette -- those were the days). A couple of decades on, she is still a firm believer that YA and fantasy for children can be just as relevant and didactic as adult fantasy. Her firm favourites are the British greats: Terry Pratchett, Douglas Adams and Neil Gaiman, and she’s recently discovered Ben Aaronovitch too. Her tastes generally lean towards Urban Fantasy but basically anything with compelling characters has her vote. I loved this book, too. September has just been killing it so far. I had never heard of it until I read this, so thanks, Bill. I will have to order it. Oh excellent, another name to add to my queue of women writing spec-fic for my #2015YearofReadingWomen. This sounds right up my alley. Thanks for the review! Great review of what might be my pick for best book of the year! Bill, I might not have found it if I hadn’t read your review, so thank you very much! I waited on reading this one because I wanted to see how it would hold up after the initial buzz, but if Marion and Rachael both loved it, I guess I don’t have an excuse not to read it! Even though this book isn’t my usual cup of tea, it will have to go on the TBR list (the short list, which will actually be read in the next 12 months!). Not only has it received glowing reviews from dozens of readers I respect, but the reviews themselves have a lyrical quality that must be inspired by the book itself. I held off on reading this because of ‘post-apocalyptic burnout’…I mean how many new themes and angles could writers find with this tried and true concept? But “Station Eleven” is really terrific. It’s much more a literary piece than anything of a specific genre. I highly recommend it. And thank you for the two terrific reviews! I thought it was the best example of a literary work incorporating a speculative element that I’d read in a very long while.